In 1967, at the height of the Cold War: Russia and the United States are racing to be the first to put a man on the moon is afoot. Suspicions are brewing within the CIA that a Russian spy has infiltrated the inner circle of NASA in an attempt to sabotage the Apollo Program. Two young agents from the CIA's A/V department present a plan to expose the mole, and their supervisors reluctantly agree. 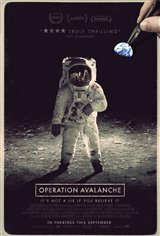 They go undercover as filmmakers tasked with documenting the nation's journey from the earth to the moon. To the chagrin of the powers that be, these crack agents uncover a conspiracy far more shocking than Soviet spies. The government is hiding a dark secret about Apollo, and the White House will stop at nothing to silence those who discover it.